Learn the craft of mosaic making, no experience required. Making a mosaic out of ceramic is extremely enjoyable – you will also take home your very own mosaic to display in your home or garden! 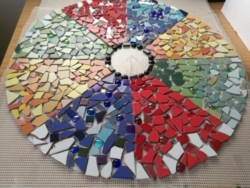 Basic mosaic making techniques include selecting a base, using nippers, cutter and hammers correctly, designing the shape and colour, grouting and cleaning and finishing off.